Salt, pepper, mustard pot & lid, stand. There is a tiny chip to the salt pot just on the top beside hole I have tried to show this in the last photo, both salt and pepper have there original stoppers although they are loose and fall out. Twintone Range. More Twintone Listed See Poole Category. Ice Green & Seagull. 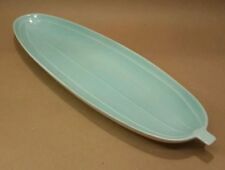 This is a fabulous Poole Twintone cucumber dish in what I believe is the Sky Blue & Dove Grey colourway. It is in really lovely clean condition with no chips, cracks or crazing, showing little if at all any signs of use. It measures approx 32cm long. Please see my other listings for more vintage and retro items. Poole Pottery Twin tone. Decorated in Ice Green & Seagull. A superb coffee set for six in sky blue & dove grey Twintone combination C104, velum semi-matt glazes in the iconic 1960s "Contour" shape designed by Robert Jefferson. 1 hot water jug 18 cm tall (inc. lid) x 9.5 cm at base (14 cm handle to spout). ICEGREEN & SEAGULL C57. POOLE POTTERY. Made in Poole England. Marked Poole to base. INDIAN TREE PATTERN. Bright white body and beautiful Indian inspired garden design. Washington Pottery. 2 Serving Tureen lids. Poole Pottery Twintone Coffee Pot, Hot Milk Jug and Sugar Bowl. Dispatched with Royal Mail 2nd Class Poole Pottery Twintone Coffee pot, hot milk jug and sugar bowl in mushroom ice green colour way. Or you could call it pale pink and turquoise In excellent condition with no chips or cracks however the milk jug does have a chip on the spout - please see photographs Coffee pot height: 18 cm/7 inches Jug height: 15 cms/6 inches Sugar bowl height: 5.5 cm/2.25 inches I also have a set of espresso coffee cups and saucers on another listing. Beautifully made Poole pottery tankard mist blue and peach. A small tea pot, Poole pottery Twintone. Mushroom and sepia. 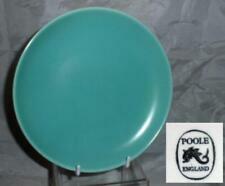 A stunning pair of vintage Poole pottery serving bowls twin tone sky blue and grey. Absolutely excellent and perfect condition. 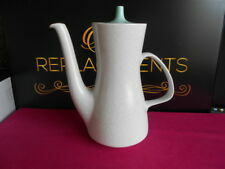 A Poole Pottery " Blue Mon " pattern Twintone coffee pot in very good condition. The coffee pot is 22.5 cm high. 6 saucers, 3 cups, 1 large, 1 medium, 3 pudding plates, 6 tea plates, 5 cereal bowls, 5 soup bowls, 1 medium and 1 small jug. Has had very little use AND is IN VERY GOOD CONDITION. A Twintone Poole vase/bowl, a boat shaped bowl in a grey body, blue inside, with the Poole dolphin mark on the bottom, number c104,, great condition except a flea bit on lip hardly notice,. Blue and Grey Twintone. We cannot rectify a problem if we are not aware of it. Poole Pottery Twintone. Decorated in Ice Green & seagull, mottled Grey. Small chip to the lid. Twintone Sky Blue with Grey. We are moving. 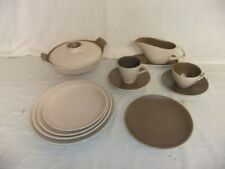 See my matching starter plates and side plates, gravy boat etc. Non-smoking, no pets, allergic obsessively clean household. I try to describe faithfully and have never had problems. AUTHENTIC POOLE POTTERY STAMP ON BASE. POOLE POTTERY TEAPOT AND LID. GREEN AND WHITE COLOUR. GOOD CONDITION. Very Large Elongated Planter Trough Vase, C54. Poole Pottery Twin tone. Decorated in Mushroom & sepia. Poole Pottery Twin tone. Decorated in Peach Bloom & Seagull. Coffee pot by Poole potteries - it is back stamped but its very faded. Stylish mid century poole pottery vegatable dish with lid. if we are short of volunteers it may take a little longer. in very good condition.